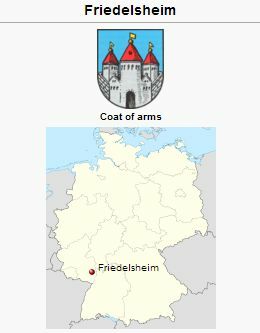 Friedeisheim is a village near Bad Durkheim in the Palatinate, Germany, the seat of a Mennonite congregation since the earliest period. Its beginning is closely connected with the Friedelsheim castle, which was built in 1418. In the Thirty Years' War it was conquered and burned with the village Friedelsheim, and the remains were completely burned in 1689. Elector John William leased the village with the estate belonging to it in 1698 to his chancellor Francis Melchior von Wieser, who began to rebuild the castle. His son Francis Joseph completed the building and used it as his residence. During the French Revolution the castle was burned by the French on 4 May 1794. In 1800 Duke Francis Joseph, the son of Count Frederick, had a new residence built, which became the parsonage; together with the chapel close by, it was popularly called "die Burg." When the Mennonites came to Friedelsheim cannot be definitely ascertained. The first certain information concerning their presence is found in a rental contract of 1682, in which Elector Charles Louis leased his Friedelsheim estate, about 1,000 acres, together with the dwelling houses and farm buildings of the Mönchhof, now called the "Mennonitenhof," to Christian Herschi, Ulrich Weydmann, Jose Erbsal, and Hans Burgholder. But it is probably safe to assume that Mennonites had been living here before 1682 and that they had likewise been renters of the electoral estate; for the contract states: "As the same has been held by the renters before them." Very likely soon after the Thirty Years' War some of the refugee emigrants from Switzerland who came to the Palatinate settled in Friedelsheim. Religiously they were tolerated. "They shall have no public or secret meetings or conventicles attended by others than those living on the estate, . . . much less draw or mislead our other subjects and people to them." According to this it may be assumed that a congregation had already been formed, especially since in addition to these four families, the Mennonites Ulrich Wilemi and Christian Hummel are named around 1685. Some information concerning members living outside is found in the reports which the electoral government required from time to time on the numbers, names, and financial circumstances of the Anabaptists. Not more than 200 families were to be admitted to the Palatinate and each family was to pay its protection fee of 6 florins, and these lists were to serve as checks. But they are not always complete. In 1749 there was again a change in the contract. The document states: "Since all of my lessees have in part died, and in part emigrated, I have found it necessary to take other renters, having the names Daniel Brennemann, Johannes Risser (Hans Rüsser), Abraham Risser (Rüsser), Johannes Strohm, Jakob Lichty (Lichte), Johannes Leysi (Lysy), and Ulrich Wittmer." Religious freedom for the renters had been somewhat extended; they were permitted to hold meetings together with the foreigners in the neighborhood quietly on the condition that one of those living there should annually contribute a pound of wax to his chapel, and their funerals were to be conducted without music or the use of the church bells. The Mennonites had indeed acquired "a little spot for hereditary burial" (Gem.-Kal. 1909, 55 and following.). How long this little cemetery was used is not known, but it may have been discontinued after the French Revolution, which brought to the Mennonites social and religious liberty. The Mennonites had their own meetinghouse very early; in 1779 a new one was built, because, as a document says, "the meetinghouse is quite dilapidated." Outwardly it had to look like an ordinary peasant home with a chimney. Indeed, the date and the inscription which had been carved in the stone over the entry had to be completely covered with mortar. During this time the Wieser property was sold to citizens of Friedelsheim. Most of it was acquired by former Mennonite renters. In 1803 the castle estate with gardens, buildings, and remains of walls was sold to several Mennonites, who occupied it together until 1808, and then divided it among themselves. Abram Leisy took over the "Burg." His son Abraham sold the property in 1820; the congregation bought it in 1836, for a sum of 4,000 florins, to be used for a church and parsonage. At considerable cost a building still extant, with a cellar under it, was rebuilt into a spacious chapel, which was dedicated 4 October 1848. The expenses for the purchase and building were largely covered by substantial assistance from other congregations; also Protestant citizens made considerable contributions. The Mennonites of Friedelsheim kept up their own school, very likely from the very early time. About 1814 the teacher was a certain Stübner. In 1824-1827 the Mennonite children attended the village school, but in 1827 the congregation called Jacob Ellenberger; in 1829 the school received public recognition. After this it was subject with the village school to inspection by the state and by the Protestant Church. In 1869 Ellenberger was compelled to resign because of old age, and since that time the Mennonite children attended the village school, though they received their religious instruction from their own pastor. In 1830 Ellenberger was also chosen as preacher and thereby the change was made in this congregation from a lay ministry to a professional ministry. Another preacher, who served with and before Ellenberger, 1825-1832, was Johannes Risser, a zealous and gifted man who also held missionary meetings. In 1832 he immigrated to America. He was preceded in the ministry by Abraham Ellenberger, Sr., 1765-1799 (Erpolzheim), Abraham Ellenberger, Jr., 1765-1782 (probably Gönnheim), Johannes Strohm 1765-1782 (Friedelsheim), Heinrich Wissler 1765-93 (Erpolzheim), Peter Becker 1765-1793 (Erpolzheim), Peter Weber about 1769 (Seebach), Heinrich Krämer 1786-1789 (Seebach), Heinrich Pletscher 1790-1816 (Friedelsheim), Jakob Neff 1791-1811 (Hardenberg), Heinrich Ellenberger 1812-24 (Friedelsheim), who moved to Eppstein and served as minister of that congregation until he immigrated to America in 1850. The Erpolzheim congregation was very closely associated with the Friedelsheim congregation, so that the two actually formed a single congregation. Among its members were also the Mennonites of the surrounding villages—in addition to Gönnheim and Wachenheim, also Dürkheim, Seebach, Hausen, Hardenburg, Grethen, Ungstein-Pfeffingen, Leistadt, Herxheim, and Freinsheim. In 1843 the Mennonites living in Dackenheim also united with this congregation. According to Frey there were in the area in 1834 a total of 198 Mennonites, 99 of them living in Friedelsheim. Between 1803 and 1824 the congregation of Assenheim also merged with this congregation. It is not known when the Gronau or Alsheim Mennonites joined this congregation, but it was probably at the beginning of the 19th century. Mennonites had been living there since very early times (for particulars see Mennonitisches Lexikon I, 705, footnotes). In 1833 the Kohlhof congregation near Schifferstadt merged with the Friedelsheim congregation, though it has kept its identity to a certain extent and ook part only in matters pertaining to the pastorate. In 1861 a closer union was made financially through the establishment of a "Menno Fund" in commemoration of the quadricentennial of Menno Simons' death, to provide for their common needs, in which the Mennonites of Kohlhof and Friedelsheim both took an active part. This foundation rendered a good service to weak congregations and grew to 30,000 marks before the inflation of 1923. With 1857 the Branchweilerhof congregation was also served once a month. But this connection was only a personal one with the minister Jacob Ellenberger. In 1879 Jacob Ellenberger died after a very active life as a minister and teacher. His nephew Jacob Ellenberger II, who succeeded him in office in 1881, wrote his obituary under the title, Jakob Ellenberger, Lehrer und Prediger der Mennonitengemeinde Friedelsheim. Ein Lebensbild, dargestellt auf Grund seines handschriftlichen Nach-lasses. Mit einem Anhang einiger seiner Gedichte (Frankfurt, 1879). As a poet he was also represented in the hymnal of the South German Mennonites by hymn No. 226. Jacob Ellenberger II served the congregation from 1881 until his death in 1901. His successor, Gustav Stauffer, died in May 1903, after having taken over responsibility for the congregation only in November 1902. In 1904 Johannes Foth became the minister of the congregation. He was still serving in 1954, when he observed his 50th anniversary as pastor. In 1881 the congregation established a library, which in 1924 contained 241 volumes. The congregation belongs to the Vereinigung, the Mennonite Hilfskasse, and to the Conference of the South German Mennonites. The conference met in Friedelsheim on 7 May 1826 and 12 September 1826, and also the Palatine-Hessian ministers' conference on 28 May 1874; 24 May 1884; 30 May 1894; 11 May 1905; 6 May 1914. The conference of 1874 was important in that the first attempt was made here to unite with the Vereinigung, although the results were negative. Since 1891 the congregation has been incorporated. It was once quite numerous, but in the course and urgency of the times it has lost many members. The families which were especially strong in the earlier periods saw too little chance for making a living here and immigrated to America. This was chiefly the case in 1824-1855, when about 160 persons from the congregation emigrated. Many of the Leisys, Schowalters, Rissers, and other families now living in Kansas, Oklahoma, and other states came originally from Friedelsheim. In 1952 the membership (without Kohlhof with 65 souls) was 135 (including unbaptized children), who were living rather widely scattered in 16 villages and towns. Some Mennonites from the Danzig area have joined the communities and congregations. Braun, F. "Nineteenth Century Emigrants from the Mennonite Congregation of Friedelsheim in the Palatinate." Mennonite Quarterly Review 30 (1956): 133-154. Hege, Christian and Christian Neff. Mennonitisches Lexikon, 4 vols. Frankfurt & Weierhof: Hege; Karlsruhe: Schneider, 1913-1967: v. I, 703-706. Foth, Johannes. "Friedelsheim (Rheinland-Pfalz, Germany)." Global Anabaptist Mennonite Encyclopedia Online. 1956. Web. 22 Apr 2019. http://gameo.org/index.php?title=Friedelsheim_(Rheinland-Pfalz,_Germany)&oldid=146435. Foth, Johannes. (1956). Friedelsheim (Rheinland-Pfalz, Germany). Global Anabaptist Mennonite Encyclopedia Online. Retrieved 22 April 2019, from http://gameo.org/index.php?title=Friedelsheim_(Rheinland-Pfalz,_Germany)&oldid=146435. Adapted by permission of Herald Press, Harrisonburg, Virginia, from Mennonite Encyclopedia, Vol. 2, pp. 398-400. All rights reserved.